fret caculator I found online. I used this formula for a couple of neck jobs with odd scale lengths. For Building your own practical fret slotting machine, please refer to my eBook soon to be published. 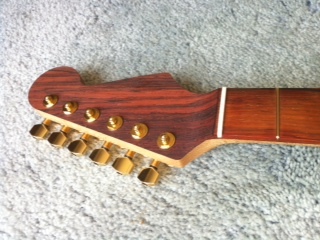 As my orders for necks started to increase, my ability to manually slot fretboards became impractical. Take it from me, I wanted to manually slot each neck but the miter saw blade seems like it expands as it heats up from friction and gets harder and harder to saw as the slot gets deeper. The saw actually feels like it is a slip fit when the blade is cold and a press fit and pinched in the slot when hot. Not sure if this is really happening, just what it feels like. I even tried some types of blade lubrication with no luck. There is much detail when it comes to slot depth. 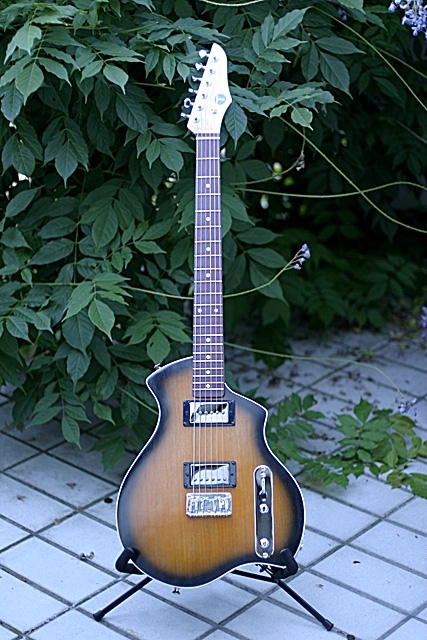 In a perfect world, it is nice to have .010″ depth below each fret tang. As the radius changes down the neck, the flat bottom slot cannot match the effect of the taper and radius at the fretboards edge. I will discuss tips and tricks in detail in the eBook. This is beyond the scope of this blog. Thanks for checking out this blog and please join my newsletter and pass this blog along to anyone you think may be interested in it or my product recommendations. I don’t want the downstream builders to suffer my trials along the road to building their dream neck. 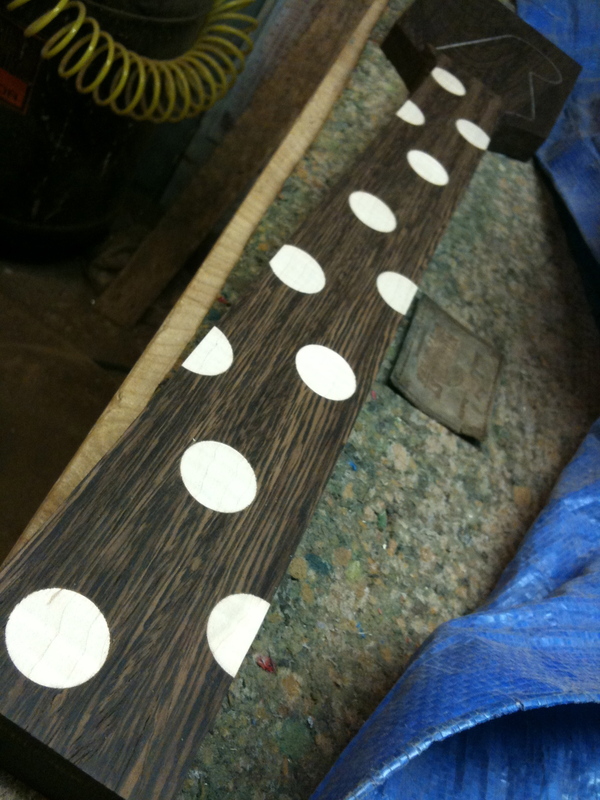 Stage 7) Making the fretboard. 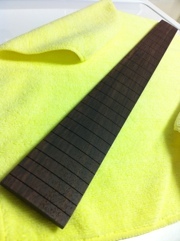 Select a premium grade of wood for the fretboard. I bring the stock down on my drum sander so after gluing, my fretboard and neck blank thickness will be 1.010″ when finished. I will explain a little later in the backside routing process the need for the .010″ extra stock. Before I route the radius into the fretboard I use a Jet 16-32 Drum Sander and take the stock down close to my total neck thickness using 80 grit sand papersand paper. A great tip for loaded up sandpaper is using Gorilla Tape to stick to the buildup. after several stick and re-sticking applications, you will see a major improvement in stock removal. 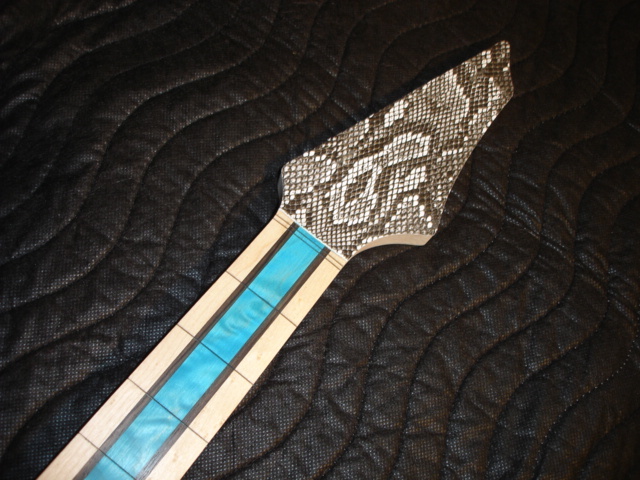 Using the fretboard template, I draw out the fretboard shape on your stock. For darker woods I use a Prismacolor Premier Colored Pencil, True Green Lead. For some reason this color stands out on the widest variety of wood species. On maple, I just use a mechanical pencil with 0.5mm or 0.7mm lead . Next, we put the centerline down the Neck. Stage 6) Making the fillet for the truss rod channel. Making the fillet for the truss rod channel. 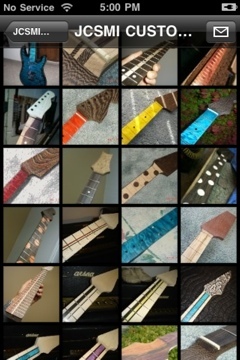 I use a piece of flat stock scrap from the maple fretboard blanks. I saved the first working fillet and use as the template for all other fillets. The use of a .03mm mechanical pencil helps in getting as close to the original as possible. Gently rotate the led of the pencil, topside of led towards the original template. Now I take the maple stock with fillet outline over to the band saw. I cut as close to the pencil mark as possible with out crossing into the fillet. If there is more stock than needed, I head on over to the belt sander and slowly remove stock to the pencil mark. The next step is to put the semicircle at the back end plan view. This is done to match the truss rod trench near the heel of the neck. Lastly, I drum sand the final thickness of the fillet till I have the correct fit into the truss rod trench. Use 10-32 threaded rod cut to length. Use a tap and die set to clean up the threads that will be used with the adjustment nut. Be careful not to cross thread the 10-32 threading. Next we need to make the anchor slug. Make sure it is thick enough to have enough thread engagement. Find the center of the slug and use a center punch to indent the center point. We are going to drill a through hole that will allow us to cut 10-32 threads into the slug. Then we screw the 10-32 threaded rod into the end of the slug. The eBook following this blog will have more detail on making the truss rod. I use plastic straws that are cut to length to keep the glue from getting to the treading. Using 2 straws for this process works out perfect. Tape the straw joint with Scotch Magic Tape to keep the wall of the plastic straw as thin as possible. Vaseline the threads for the adjustment nut and the bearing face of the nut to eliminate unnecessary friction when adjusting the truss-rod nut. Once you have the neck blank cut out, you need to put a centerline on the blank. This centerline will be used to center the fretboard when gluing and also be used to prep for truss rod installation. *We are going to discuss how to install the single action heel adjust truss rod here. We need to drill an adjustment nut hole into the heel of the neck. Before we do this, I drill a reference hole into the top side where the nut adjustment hole will stop. This allows me to insert a single action trust rod into the nut adjustment hole so that I have a visual inspection of my trust rod passing through the adjustment nut hole and lining up with my truss rod centerline. I use a special jig with my router to route the single action truss rod channel. The jig routes a curved channel in the side view. This allows for a curved fillet of wood to be inserted and glued into the channel after the truss rod is installed. A tee slot is then routed into the neck blank near the nut end for the anchor slug of the single action truss rod. I will try and show photos, dimensions and illustrations in an eBook when finished with the building instructional on this blog. Thanks for following! Jim at jcsmi. 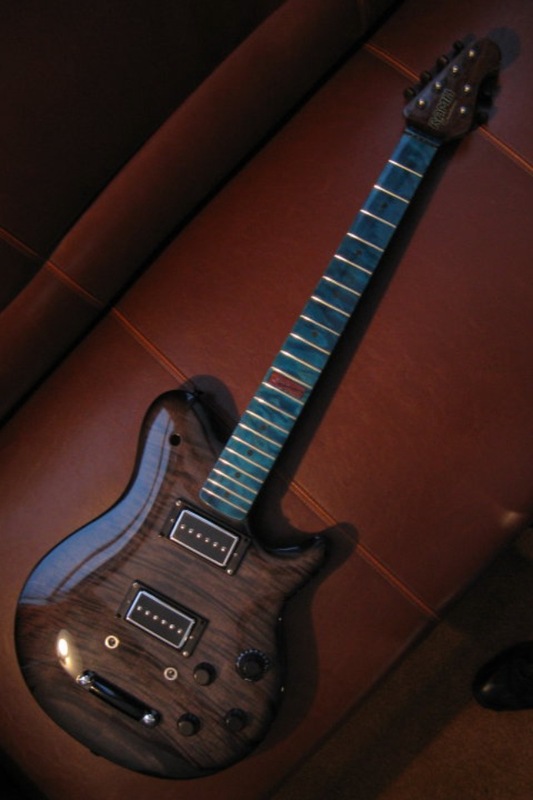 Guitar by RAMM Guitars, Neck by JSCMI. Stage 3) Cutting out the neck blank. Next we need to cut out the wood blank keeping a 16th of an inch from the pencil mark we made in stage 3 using the plastic template. I use a bandsaw to perform this task. Try and make four or five relief cuts so you do not have to cut a lot of curvature at one time around the headstock and the heel of the neck blank.